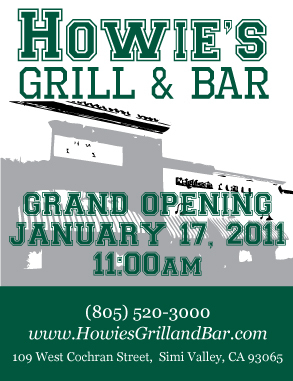 Thanks to Sue of Simi Valley for informing us of the grand opening of Howie's Grill & Bar, located at 109 West Cochran Street (that's just a couple blocks away from the Simi Costco for those in the know), on Monday, Martin Luther King Day, January 17, 2011. This was previously the location of Applebee's. Howie's is a sports-themed grill and bar with "An eclectic menu full of items including a melt-in-your-mouth Fried Mac N Cheese, a creamy home-made Mac n cheese tossed in panko and fried crisp with ranch and Louisana hot sauce sides and the flavorful Pulled Pork Sliders, a slow roasted hand shredded pork sandwich adorned with cole slaw, BBQ sauce, pickles amidst a sweet Hawaiian roll score an outright homerun. For those with a sweet tooth, an assortment of sweets such as the heavenly Strawberry Shortcake with a gusto of vanilla,strawberry and buttermilk flavors and the luscious Red Velvet Cake, a delightful mix of moist crimson-colored cake layered with smooth cream cheese filling is an absolute hole-in-one." These Kobe Beef sliders at Howie's Grill & Bar look pretty darn tasty to me. There goes my 2011 resolution to go vegetarian. Howie's also has 23 high-def TVs, including 2 65 inch screens. More info at www.howiesgrillandbar.com or call 805.520.3000.